Issue 1: November 2007; Issue 2: March 2008. Some 800 years in the past, in 1206, a brilliant Muslim scholar died: Badi` al-Zaman Abu al-‘Izz ibn Isma`il ibn al-Razzaz al-Jazari. He was one of the most important inventors and mechanical engineers in the history of technology. 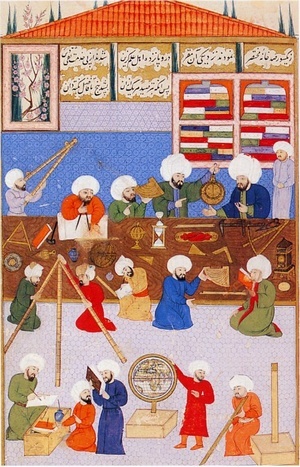 His magnum opus book of mechanics, the famous Al-Jami` bayn al-`ilm wa 'l-`amal al-nafi` fi sina`at al-hiyal (A Compendium on the Theory and Useful Practice of the Mechanical Arts) was the most significant treatise of the Islamic tradition of mechanical engineering and a ground breaking work in the history of mechanics. We devote this folder, that will be enriched progressively during this year, to celebrate al-Jazari and his ground breaking work. The List of articles on Al-Jazari published on www.MH.com. Click here to view the new series of studies we published on the academic website of FSTC www.MuslimHeritage.com. These publications cover numerous aspects of Muslim heritage in science, technology, history and culture, including valuable contributions by eminent scholars in the field and coverage of different topics. The articles are illustrated with video animations, multimedia materials and graphic illustrations often extracted directly from unpublished manuscripts..
To stay informed about past and future events attended by FSTC members and Muslim Heritage related events, click here.